Remember, to mark your calendar this Friday! 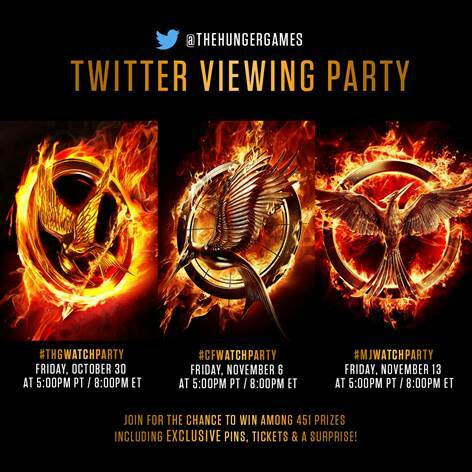 Join @TheHungerGames on Twitter November 7th, 2015 for the SECOND Hunger Games Watch Party! We’d love for you to catch up on all of the films with us from the very beginning. Participate by live tweeting @TheHungerGames for the chance to win 1 of 451 prizes, including EXCLUSIVE Mockingjay Pins & Mockingjay Tickets from Fandango!